One of the things that never occurred to me until this year was that I might end up adapting a play by Marivaux for the stage. 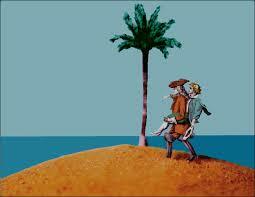 Marivaux’s L’Ile des Esclaves is a one-act play first performed by the Comédiens Italiens in 1725. It tells the story of two ancient Athenian aristocrats and their slaves who are washed up after a storm wrecks their ship to discover that they have landed on an island run by the descendants of former slaves. A role reversal comedy along the lines of the 80s cinema classic, Trading Places, it sees the masters become slaves and the slaves become masters at the behest of the Island’s leader, Trivelin. I’d become interested in Marivaux having noticed a succession of reviews of productions of his work in Le Monde. In an idle moment in the library I saw Marivaux’s name and thought I’d check him out. My sole previous experience of classical French theatre was being made to study L’Avare for A-level. And I mean study in the loosest sense. The pursuit of knowledge being strangely absent from our school’s ethos, even in Sixth Form, my familiarity with Molière’s text was based solely on having watched a BBC production starring Nigel Hawthorne in the title role. I thus approached Marivaux cautiously and chose L’le des Esclavesas as my introductory text, which weighs in at an easily digested 60 pages of text. The language wasn’t as difficult as I’d expected. Some archaisms apart I could follow the dialogue well enough and the classic role reversal plot was very entertaining. I was interested to see if there had been any translations and was delighted to find an edition of his plays in English in the excellent Skoob Books of Bloomsbury. The Island of Slaves had been translated by William Gaskill for a performance at RADA in 1986 and I rattled through it very quickly. While reading it in classical French I hadn’t been especially bothered by the very eighteenth century social and gender attitudes of the text. However, reading it in modern English made it seem rather anachronistic, especially the ending. 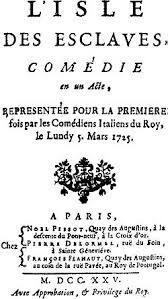 Although Marivaux’s comedy was quite radical for its time in positing a situation where aristocrats are taught to improve their morals by their social inferiors it struck me that the play’s resonance with the twenty-first century was let down by the docility of the female characters and the socially conservative message embodied in the restoration of the hierarchal status quo at the resolution of the plot. I just couldn’t see how you could play the text straight in the modern world. So it seemed odd that RADA had chosen to do so. At least on the page, it may be that their staging undermined the socially conservative resolution. So I began to turn over in my mind how one could update the piece for a modern English audience. Firstly, I did this as a kind of academic exercise. I was commuting to Leicester for a VL job at De Montfort once a week and Stella time on the train back seemed more productive if engaged in a bit of translation for pleasure. Then it occurred to me that with members of the Crouch End Players among my circle of friends and the Crouch End Festival coming up, I might be a bit more ambitious and actually get it staged. I began by going back to the French original, trying to put all thoughts of the English translation out of my head. Attacking the text I soon came up against a problem which has long been recognised – to what extent should I place the translation in the context of the time of its production? Should I attempt to replicate the eighteenth century terms in like for like English? Or should I rather place the translation in the context of the audience for which I intended it, a non-specialist festival crowd likely to be assembled in the function room of a pub? At De Montfort I’d noticed that the ‘Centre for Adaptation Studies’ occupied a corridor along the way from the historians. Adaptation Studies was a new term for me so being an academic I thought this sounded like something that might be able to help me formulate a structured approach to adapting Marivaux for the English stage. I was wrong – Adaptation Studies is concerned more with the adaptation of texts from one form to another, for the most part novels to films. What I was looking for was Translation Studies, which has its home in this country at UCL and has a much longer-established methodology. In Western culture Translation Studies’ founder (although like all firsts this is disputed) is St. Jerome, who coined the concept of sense-for-sense translation as sound practice compared to literal translation with the former using sentences rather than individual words as the basic units for making a new text. Cicero put this more pithily in his De Opitimo Genera Oratorumwhen he explained that in translating from Greek to Latin, he ‘did not hold it necessary to render word for word, but … preserved the general style and force of the language.’ Which seems a bit of a no brainer to me. A more thorny issue might be that defined by Lawrence Venuti in the 1990s as the issue of whether to take a ‘domesticating’ or ‘foreignizing’ approach to translation. That is, whether to keep the original cultural context or move it to that of the target language. Again, this seemed straightforward to me, I wanted to not only translate but update Marivaux and make it not just relevant but topical. Which is where I wanted to go beyond the translation that I knew, Gaskill’s, and also one that I was aware of – Neil Bartlett’s. His translation was for a production at the Lyric Hammersmith and I definitely wanted to steer clear of his version as I suspected that he might have wanted to make a more radical intervention to the original than Gaskill for RADA. However, from skimming the introduction and the opening few pages it seemed that Bartlett too had largely respected Marivaux’s concept and resolution. 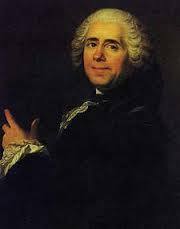 His introduction was very informative, especially in its notes on performance style in Marivaux’s day, outlining how actors would be expected to add in their own songs and jokes to liven up a show for the audience. So I took this as carte blanche to do my own bit of embellishment for the Festival crowd. I felt the field was clear for a radical revision of L’Ile des Esclaves for the post-Crash generation. The island is now Corbyn Island and our castaways are not Athenian aristocrats and slaves. For present times I felt that a Premier League football manager and his youth team coach on one hand, and a media-savvy interior designer and her PA on the other, would have something to say about contemporary class relations. And they get washed up on Corbyn Island, the last refuge of socialism in a post-UK dominated by Theresa May. Rather to my surprise the play is happening! It’s been the most interesting piece of writing I’ve ever done, going from a straight translation through rewrite after rewrite taking on the advice of an experienced writer for the theatre (my friend Phil Woods) and my fellow director, Anna Rogers. Speaking with my academic hat on I’d say that I’ve learnt two valuable things in the process of going from translation to rehearsal. The first is that however obscure are some of the rabbit holes I’ve been down as a historian none have so far been as obscure as wading through the literature on Adaptation and Translation Studies. Though each has been fascinating I’ll be glad to get back to the dry ground of archive-based research for the SSFH Conference in June. Secondly, I’ve never had to work so collaboratively on a piece of writing before. I’ve been through the editing process for articles and books but taking something you’ve written and then rewriting it in the light of how an actor says the line is something altogether different and quite rewarding for being a shared experience. So I’d like to hear from other historians who have worked in the same area, whether as specialists in eighteenth century France or in doing something similarly off beam to the regular grind of being a historian. As much as I’ve strayed from Marivaux’s source material I can’t wait to get back into reading more of his work now that I’ve discovered how rich it is. Corbyn Island will be showing on 16th and 17th June 2017 as part of the Crouch End Festival. Go to www.crouchendfestival.org for further details. Lawrence Venuti, The Translator’s Invisibility: A History of Translation. (Routledge, London, 1995). Neil Bartlett, The Island of Slaves (Oberon Books, London, 2002). This entry was posted on April 22, 2017 at 8:57 am and is filed under Academia, France, London, Theatre, Writing. You can follow any responses to this entry through the RSS 2.0 feed. You can leave a response, or trackback from your own site.